Our enforcement system isn't working. What's the Taylor Review going to do about it? “The two-tier enforcement framework in the UK works”. Employment tribunal fees price people out of justice. Ministry of Justice statistics show that claims have dropped by 67%, since fees were introduced. Because prospective claimants couldn’t afford to pay fees. Over 250,000 people are not being paid the correct National Minimum Wage rates. Both are strong indicators of an enforcement system that isn’t working. We need big changes to our enforcement system to make sure that working people can enforce their employment rights. 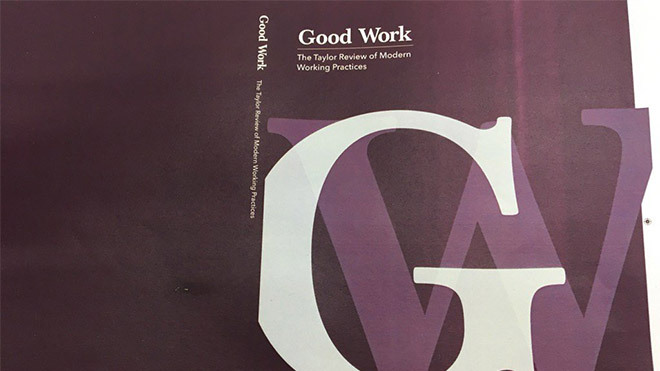 So, what does the Taylor Review propose? Not a lot, and nothing that hasn’t been done already. It suggests that the government “continues to keep the level of fees under review”. In January 2017, the government published a review on employment tribunal fees. Despite revealing evidence that people found fees to be unaffordable, they failed to lower or abolish fees. It’s unlikely that a further review would lead to the government abolishing or even lowering fees. These are welcome suggestions that should make it easier for lower paid, insecure workers to enforce their rights. Agency workers, for example, would be able to contact EASI if they suspected they were not receiving equal treatment in terms of their pay. The TUC carried out a survey of insecure workers earlier this year and time and time again, enforcement of holiday pay was flagged up as an issue. The Review does acknowledge that statutory enforcement agencies have “limited resources”. EASI’s budget is an example of this. Since 2010 it’s been cut roughly in half to £500,000. Enforcement agencies must be given additional resources to carry out these new functions effectively. Beefing up the enforcement agencies, however, isn’t going to help the majority of working people. We have a two tier enforcement system. Employees who can afford to pay a fee can enforce their full range of employment rights. All workers can rely on the statutory enforcement agencies to enforce their basic, core workplace rights (such as the National Minimum Wage). But what does this mean for low paid employees who are unfairly dismissed or discriminated against in the workplace? They can’t afford to bring an employment tribunal claim. The Taylor Review hasn’t offered anything to these workers. That’s why employment tribunal fees need to be abolished. At the moment, a claimant has to prove to a tribunal that they are a “worker” or “employee” where their employer disputes this is the case. For example, in the recent Uber case supported by GMB, the drivers successfully proved they were “workers”. The Taylor Review recommends reversing the burden of proof. This means the tribunal will presume a claimant is an employee/worker. The employer must then prove that the claimant is not entitled to relevant employment rights. On the face of it, this is a helpful suggestion. Online tools are not sophisticated enough to make sound judgments on employment status. Employment tribunals currently do this job, and they have a great deal of experience and understanding of the case law that has developed in this area. It’s very difficult to see how an online app will be able to determine the reality of the working relationship. The Review has suggested that employers should face increased penalties and have to pay the costs of the claimant where they contest and lose a status case, if they have already lost a similar case. Strengthening public procurement rules to ensure contracts are not given to companies which have failed to pay ET awards. Company directors who fail to pay ET awards (more than once) should be debarred. Overall, there are some welcome recommendations in the enforcement section. But this is mainly tinkering around the edges. And the review has failed to tackle the single, biggest barrier preventing people from enforcing their employment rights; employment tribunal fees. There’s a wide consensus that employment tribunal fees should be lowered/scrapped. Trade unions, the CBI, Citizens Advice Bureau and employment lawyers have all called for fees to be scrapped or significantly reduced. The Taylor Review ignored these calls. Taking a claim to employment tribunal is the principal way for workers to enforce their employment rights. Prospective claimants have to pay fees of up to £1200 and this has priced many workers out of justice. If people can’t enforce their rights, then their existing rights (and, any of the new rights proposed by the Taylor Review) are pretty much meaningless. As I pointed out at the beginning, the Taylor Review drew the wrong conclusion on our enforcement system, so it’s not surprising that its recommendations fall short of what is needed to create a robust, effective enforcement system. The law needs to change to ensure that the companies and organisations who are in practice responsible for undercutting employment standards or mistreating individuals are held to account for it. The best way to achieve this is to move towards a system of joint and several liability for employment law standards throughout supply chains. The licensing model currently used by the Gangmasters Labour Abuse Authority, in the shellfish gathering, agriculture and horticulture sectors, should be extended across the labour market. We believe this is the most effective system for ensuring organisations comply with core labour standards. Licensing is an effective system for weeding out unscrupulous employers from the labour market. This is because only licensed labour providers can operate in a particular sector. Before they do so they have to prove that they comply with core licensing standards. One Response to Our enforcement system isn’t working. What’s the Taylor Review going to do about it? A right to request fixed hours is no right at all, it's a vague hope.